Taking place in the glorious Clevedon Community Centre with it’s vaulted dance floor and more Blitz spirit than Churchill’s bunker, this night will recreate the post wartime celebrations and glamour of 1940’s Bristol. 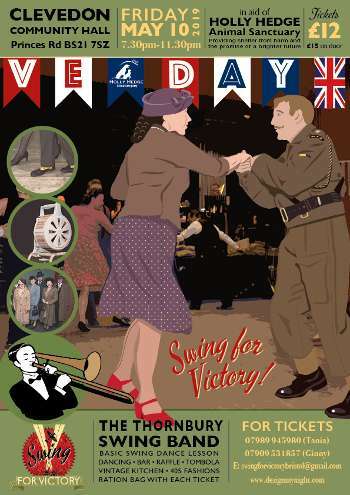 All of you fabulous victory curled ladies and uniformed soldiers can expect a wonderful night of live music from The Thornbury Swing Band, and other 40’s-style revelry. The Thornbury Swing Band will perform a repertoire of 40’s classics and swing dance favourites, the perfect soundtrack for all you land girls and home guards to keep dancing all night long. More music and dancing this year and less chat. Buying a ticket beforehand ensures you get your very own bag of rations. Tickets are £12 each when bought in advance. 1940’s attire is welcomed, though not compulsory. Bar serving all the usual. Listen to the big band sounds of the Thornbury Swing Band and dance the night away. FREE Basic swing dance lesson starting at 6.30pm. PRE-BOOKING ESSENTIAL. Hair and/or make-up available for men & women at £5. PRE-BOOKING ESSENTIAL. Fun & games to take part in. Tea, coffee and cake available to purchase from the Vintage Kitchen. Look out for wartime propaganda characters including Spivs who shall be selling their wares including special chocolate rations and vintage items. Raffle with some wonderful hamper prizes & tombola. All proceeds will go towards Holly Hedge Animal Sanctuary. Join us and the wonderful team from Newfound Friends on the 15th June at Portishead Marina for what is always an incredible day. Whether you want to join us for a rush of adrenaline or just to watch, don’t miss this brilliant event that raises much needed funds for the animals in our care. 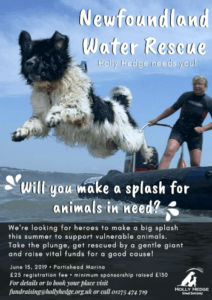 We’re looking for heroes to make a splash for our animals in need! Would you jump into the Marina to be rescued by a 150lb, web-toed gentle giant to make a better life for our rescues? You can make a real difference by doing something exhilarating! How does it work? You register and pay the £25 registration fee, start fundraising to reach a minimum of £130 in sponsorship, then take the plunge surrounded by your friends, family and Holly Hedge supporters. For more information and to register for a place please contact Hannah on 01275 474719, or email fundraising@hollyhedge.org.uk – please note that we have limited spaces for this event and participants will be registered on a first-come-first-served basis, so get in quick! 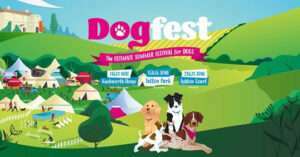 We are delighted to tell you that this year we’ll be a part of DogFest! We’d love you to join us at Ashton Court, alongside thousands of dog lovers, the Supervet Noel Fitzpatrick and Clare Balding. 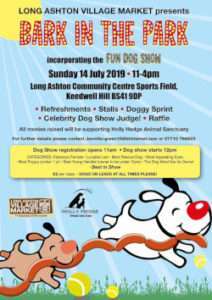 There is so much for you and your beloved furry friends to get involved in…including the Fun Dog Show which will have a ‘Best Rescue Dog’ category! They’re also offering our supporters a discount, use the code HOLLYHEDGE to get 10% off your tickets to the show! Full details to be comfirmed.